After landing from a week away golfing with some chums, The Cooktwit needed to be in top form to placate The Flame. Country walks with a decent feed tends to do the trick. In stepped The Bulls Head in Mobberley. 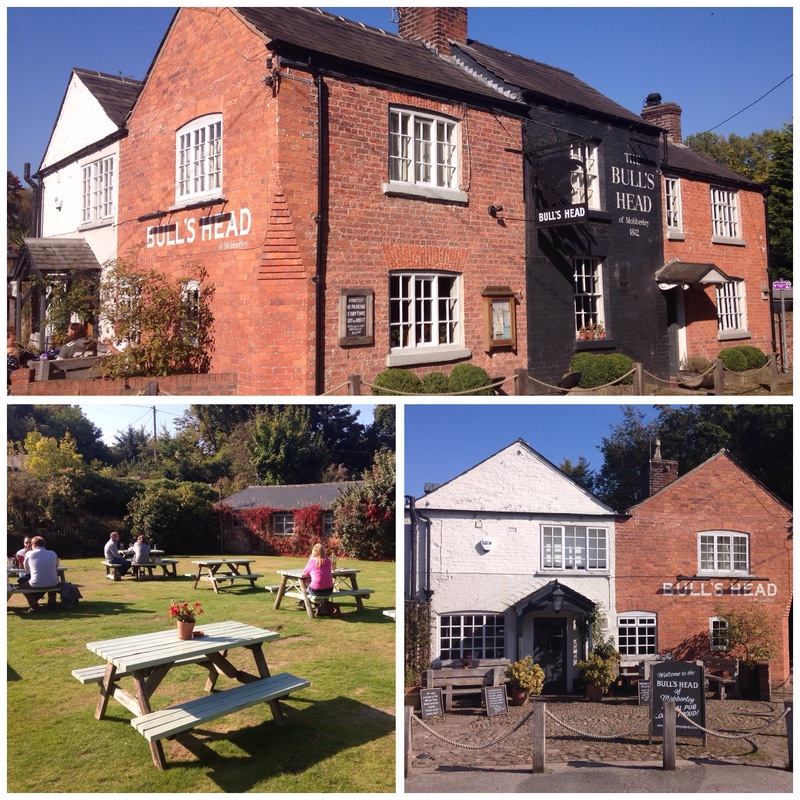 Mobberley is a quaint village set in Cheshire between Knutsford and Wilmslow. It tends to be one of the places the big North West football clubs use to house prospective foreign talent. I would suggest The Bulls Head lies at the centrepiece of the offer. It’s a perfect facsimile of the quintessential country pub. Set down a leafy lane it makes a fine sight, particularly when washed in the fine autumn sunshine that greeted us. The large outdoor garden (no doubt a former bowling green?) is lined with outdoor bench sets. Despite being only twelve thirty they are almost full of eager punters. Many no doubt slipped out from nearby offices. I slip inside to survey the set up. Six real ales line up the bar. 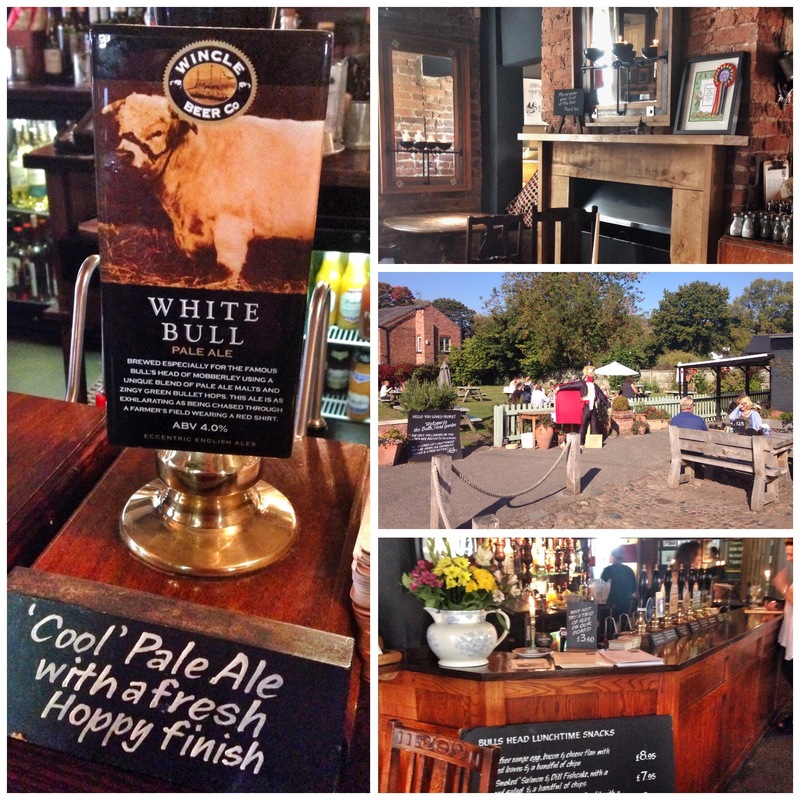 A ‘White Bull’ light ale by Wincle Beers is ordered up. As The Flame had already taken up residence outside it was the briefest of internal tours to determine the fittings. Solid tables with solid ‘seatage’ sets the tone. It’s exactly as you would imagine. I’m sure winter will bring plenty of roaring fires. It’s terrifically traditional, low beams, stone floors, jaunty signage, it’s great stuff, very comforting. I took out a couple of clipboards, each clipping a sheath of cream card. 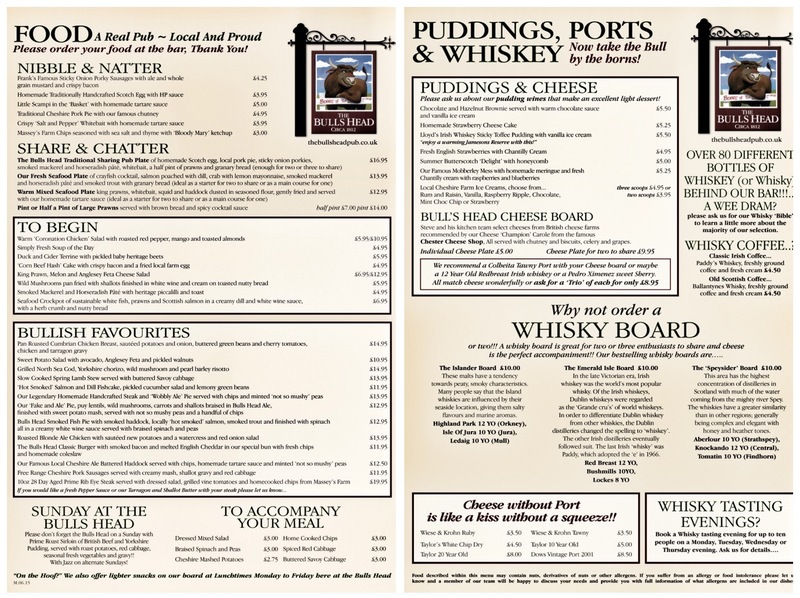 The menu is extensive and features British pub grub favourites. Sandwich of the day was crab. 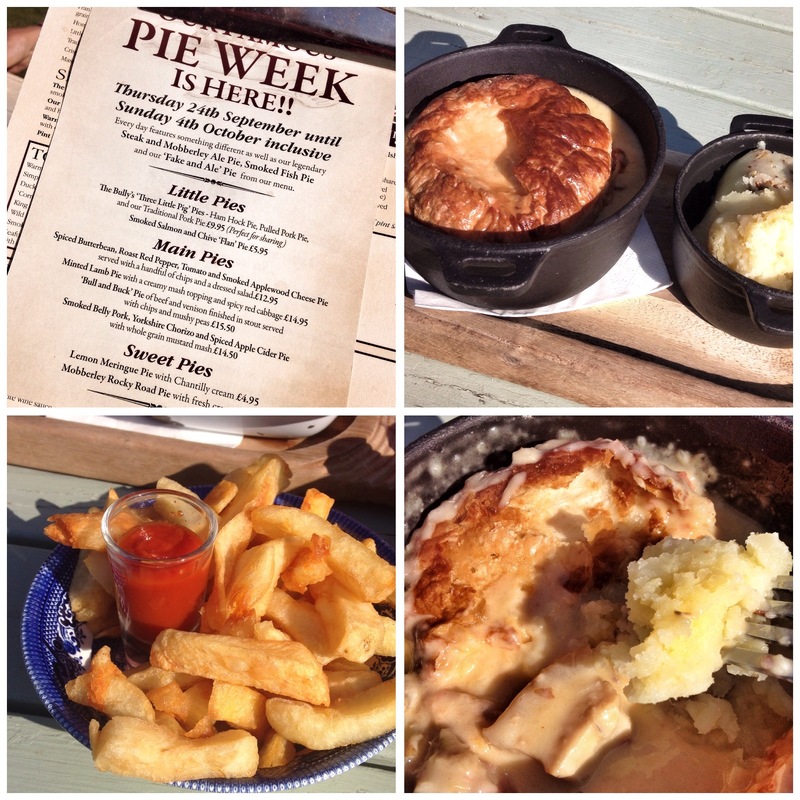 I was severely tempted but decided to test out the special ‘Pie week’ menu. I love a good pie. We both went straight for mains. 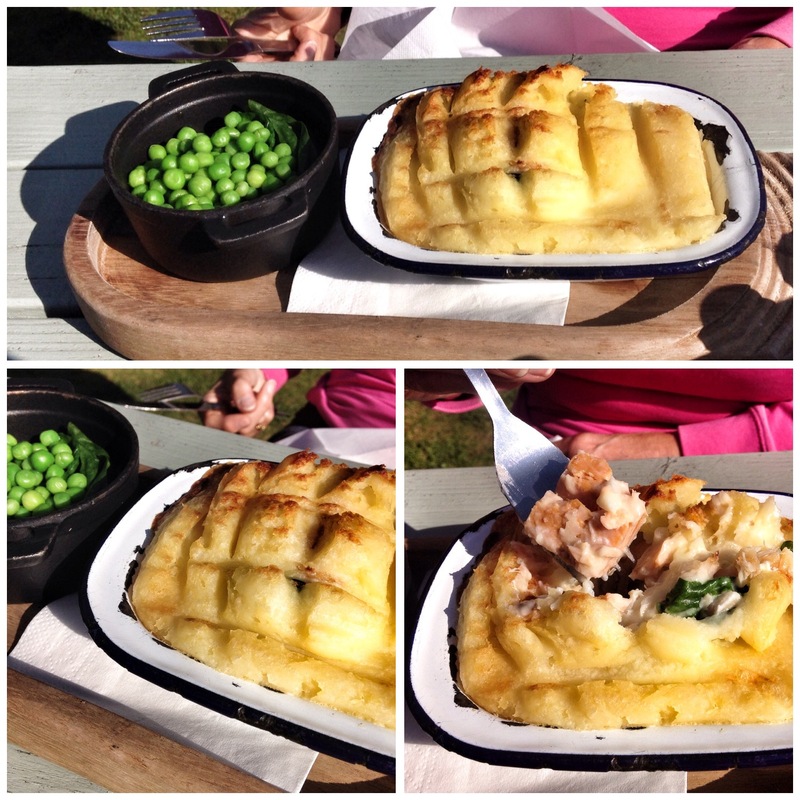 The flame went for her standard fish pie (£12.95) with a portion of chips. It arrived on its plank with some spinach and peas. She expressed a small initial disappointment when presented with the small rectangular tin, but it was short lived. It was packed with smoked fish, mainly salmon along with haddock and trout. She proclaimed it to be one of the best and a very close run thing to her all time favourite from The Church Green (see here). I ordered up from the pie week menu. Smoked pork belly, Yorkshire chorizo and spiced apple cider with a mustard grain mash (£14.50). I prefer a full pie and was mildly disappointed to receive a cast pot with a puff pastry top. However, after forking a couple of luscious globules of pork belly and some cuboids of spicy chorizo, washed in a sweet creamy sauce I was back on track. I finally mopped up with the mustard mash. It was all rather good. The chips were decent enough, but we have been treated to the Freemasons at Wiswell versions lately and it tends to slightly taint anyone’s else’s. 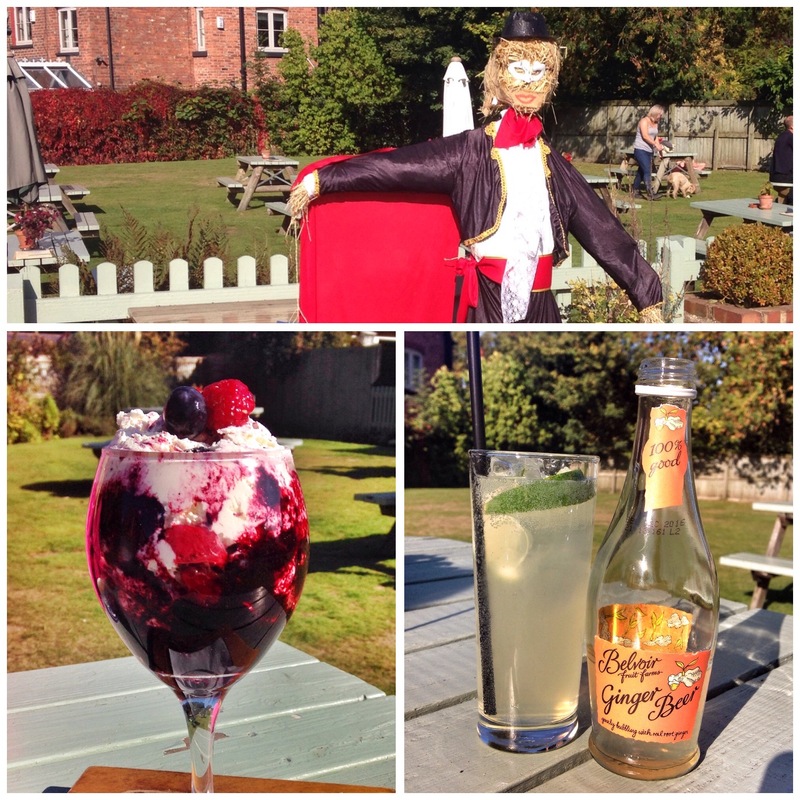 I rounded off with a ‘Famous Mobberley Mess’ (£5.25). I’m not sure why it was famous but it was rather good if you like that sort of thing (and I do!). A decent green tea and black coffee rounded off. We then took off round their three and a half mile pub walk. A natty little flyer is on hand to lead the way. As it was a glorious October day it was perfectly get ’roundable’ in trainers. I dare say wellies would have been needed back in August! A further ginger ale was imbibed on our return as recommended by the genial host. A couple of Manchester United players had settled next to us by this time. We enjoyed a truly wonderful few hours. Service was friendly and engaging. This is another one for the regular list for us. Fully recommended. Sounds like a great day – I’m feeling hungry now!